As the industry looks for a way up from the bottom, home warranties may become a valuable selling tool. Buyers, worried about the damage done by departing owners, vandals, and the weather, might appreciate the coverage of a home warranty. Industry insiders, meanwhile, report that claims costs on foreclosures aren't that different from their other policies. While the number of foreclosed properties continues to rise, sellers are beginning to leverage the "peace-of-mind" attribute of home warranties to reassure otherwise skittish buyers that they're not about to purchase a bottomless money pit. As we continue our tour of the extended warranty industry, and as we approach the end of the home warranty section of this excursion, we wanted to see if this much-vaunted attribute of the policies can generate even more peaceful and easy feelings when they become an integral part of the distressed property sales transaction. In Phoenix, Arizona, buyers of foreclosures who are making use of government-sponsored financial incentives must secure a three-year home warranty from any of several carriers, thereby ensuring that they won't one day find it impossible to pay for unexpected repairs. In hard-hit Midwestern states such as Michigan, Ohio, and Indiana, a home warranty company called America�s Preferred Home Warranty Inc. has for several years welcomed buyers of foreclosures to take out a home warranty with the company, in an effort to help stabilize communities and reduce unexpected repair bills. Across the U.S.A., buyers of any of the 41,000 foreclosures in the inventory of the HomeSteps program run by the Federal Home Loan Mortgage Corporation, better known as Freddie Mac, will be issues a free two-year home warranty administered by Cross Country Home Services. The goal of all three programs is to get people back into foreclosed homes and to keep them there. And while it's that peace-of-mind attribute that helps to convince them to buy home warranties, it's the claims-paying aspect of the policies that will hopefully make it affordable for them to stay. In March 2009, the city of Phoenix received a grant of $39.4 million as part of the Housing and Economic Recovery Act of 2008, which it must use to help eligible families buy a foreclosed home. The Act, passed by Congress in July 2008, allots $3.92 billion to help the communities hit hardest by home foreclosures and mortgage delinquencies. The Phoenix Neighborhood Stabilization Program hopes to do this through a mixture of loans, discounts and safeguards, among them a requirement that the purchased property must be covered by a three-year home warranty priced at $1,500 or below. Buyers of distressed properties are also given the option of taking a $15,000 loan to use towards the down payment and closing costs, as long as the buyer is deemed to be creditworthy. Buyers must invest at least $1,000 of their own funds in the purchase. The home must also pass an inspection, must conform to all building codes, and must have been appraised by a professional within 60 days of the contract signing. For more information about the program, investors can call +1-602-262-6602 or visit the web page phoenix.gov/nsd/fland.html. Michael Hammett, the public information officer for the city of Phoenix, told Warranty Week that the program is just beginning to produce results. "It took a little while to get the program up and running," he said, "and so now we've just begun closing on homes." There are several flavors of the program, Hammett noted. Some of the foreclosed homes are sold directly to buyers, who then finance their own renovations. Some are sold to contractors, who fix up the homes and then resell them to the actual occupants. And in some cases, the city matches a buyer with a remodeling company, and they work together to renovate the property. In all three cases, three-year home warranties are required. "We're early in this program," he said, "but we have found that it absolutely does come into play when we're marketing this -- that people know there's a protection element for the home buyers. If people go out and purchase a foreclosed home, a lot of times you just take it as it is. Whatever the issues may be, you deal with them. This is just an extra layer of protection." Although the industry standard is to sell one-year home warranties with options to renew annually, the city of Phoenix decided to mandate home warranties with an initial three-year duration. Hammett said this was done to give people enough time to settle in and gain some confidence in their purchase. One year wasn't long enough, they believed. "The city felt like that was a key component to ensure a long-term success for home buyers," he said of the three-year mandate. "We wanted to make sure that when they got into the house, that they had the peace of mind to know that if an issue arose after closing, that it would be covered. Right now, with foreclosures at record highs, we wanted to make sure this program would be successful, meaning people would get into homes and stay in them. And they would be affordable." What he means by that is a home buyer's fear that they could someday find the cost of owning a home is a lot higher than expected, because of all the unexpected repairs and replacements that arise. That's of course a risk with any home purchase, but the fear is only magnified by the home's foreclosure status. Conceivably, the costs could be so high that they can't afford to stay. And so they could someday abandon the property and the city of Phoenix would be right back to where it started, with an unoccupied home going into foreclosure. "It's made the program more palatable for people," Hammett added. "It's the city wanting to ensure that these federal dollars, when they go into play, that they're actually successfully used." That will hopefully help stabilize these neighborhoods where foreclosures are common. Old Republic Home Protection Company, Inc. Surprisingly, neither the three-year requirement nor the association with foreclosure sales seems to have frightened off these home warranty companies. Marc Roth, president of Home Warranty of America Inc., said it's not so different from selling one-year renewable policies on existing homes. "All things being equal," Roth said, "it shouldn't change things much. As long as a professional, such as a real estate professional or the third party organization that's putting these on the market -- as long as the same due diligence is being done on all the other transactions, then I see no reason not to do it." "I think it's a need," Roth added. While all homebuyers are typically nervous about buying a "lemon," buyers of foreclosures would probably be very nervous about unexpected repair costs. "And therefore they need a little bit more peace of mind." Having the warranty go for three years instead of one year seems to meet that need, he said. Of course, Home Warranty of America could just as easily sell a one-year policy and renew it for two additional years -- probably for the same price and probably with the same claims cost as a three-year deal. But Roth said he didn't see a downside in meeting the city's requirements. And, he added, it's not impossible that buyers of foreclosures that didn't go through the city's program may be signing up for one-year policies. How would he know a home was in foreclosure? "Based on my knowledge of claims in general, personally, I would be more concerned with what's not being disclosed, in any situation," he added, "not just with a foreclosure, but with any house, from a warranty perspective, than [I would be concerned about] something going bad six months, eighteen months, or thirty-six months from now." 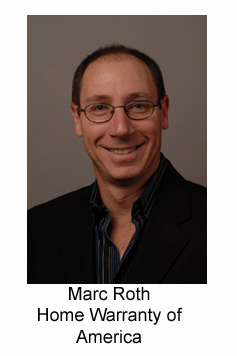 As long as there are professionals involved in the repair, renovation, and ultimate sale of the foreclosed unit, Roth said he isn't much worried about adverse selection becoming a problem. In other words, if the city of Phoenix is willing to declare the unit to be fit for habitation, and the various inspectors and appraisers also give it their nod, then he's satisfied that it's fit for a home warranty policy. Arizona is of course not the only state hard-hit by foreclosures. On its HomeSteps web site, Freddie Mac lists 1,241 properties for sale in Arizona, as opposed to 1,967 in California, 1,395 in Florida, and 932 in Georgia. In Detroit alone, there are 22 properties listed for $20,000 or below, including one six-bedroom unit priced at $4,000. Eventually, somebody will have to buy all of these units. For Freddie Mac, home warranties have now become a deal sweetener. Under terms of a sales promotion announced in July, Freddie Mac will pay the cost of two-year home warranties, administered by Cross Country Home Services, which will be issued to all buyers of its foreclosed properties. 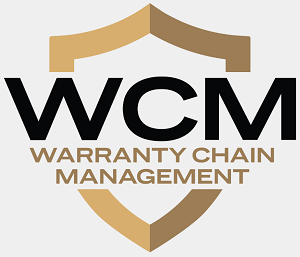 The home warranties, called Home Protect, will cover electrical, plumbing, air conditioning and heating systems, as well as ductwork and many major appliances such as water heaters, stoves, washer & dryers, dishwashers and refrigerators. Freddie Mac will pay for the first two years of the warranty, after which buyers will have an option to continue to renew it on their own. Cross Country also operates a Home Protect web site, which explains the coverage and how to file a claim. It also offers policy holders discounts of up to 30% off the list price on appliance replacements, including discounts on the installation, if required. Along with the home warranties, Freddie Mac has also announced a sales promotion under which it will pay up to 3.5% of the foreclosed property's purchase price in closing costs. Brad German, a spokesperson for Freddie Mac, said that the home warranty part of the promotion, originally set to expire on October 30, has been extended indefinitely. The closing cost assistance offer, he said, has been extended until at least January 31, 2010. "We're trying to offer various incentives, a combination of which may be giving HomeSteps properties an edge in certain markets," German told Warranty Week. Home warranties is one, and the tax incentives are another. And then there is the help with closing costs, and of course the historically low mortgage rates currently available. German said it's difficult to say which works best as an incentive. Instead, he prefers to look at them as a suite of "very powerful incentives" that could entice some otherwise on-the-fence renters or investors to buy a foreclosed home. "We think it has helped," German said of the home warranty offer. "As you know, there is a lot of product out there. And it provides a value-add that speaks to peace of mind for somebody buying a foreclosed property. In particular, there has been a perception by some when buying a foreclosed property -- people may have various preconceptions about the quality of the home, and this would try to assuage those preconceptions." The tag line on the promotion is "Rest easy in a HomeSteps home knowing Home Protect has you covered!" Besides the unavoidable repetition of the word home, the message speaks to the buyer's unspoken fear that due to neglect, vandalism, and sabotage, a foreclosure is going to cost more than it should. However, a policy such as Home Protect can transfer this risk to a third party administrator. Same Claims Cost As Other Homes? Surprisingly, the cost of claims arising from home warranties covering foreclosure properties is not much different from the cost of claims on other houses, according to one of the administrators that has for many years welcomed such business. Randy Caltrider, director of America�s Preferred Home Warranty Inc., said his company hasn't found the claims cost on foreclosures to be much different from what's seen in so-called "straight sales." "As we go back and we look at those types of sales, we're not seeing a whole lot more liability on our part," he said. "America�s Preferred Home Warranty has always offered our home warranties to foreclosures and repossession properties. We've always done that," he said. In the last three years, however, as the economy has soured and more and more foreclosures and repossessions have come on the market, Caltrider said he's seen some of his competitors also begin to offer home warranties on distressed properties. But for his company, it's always been available. America�s Preferred Home Warranty also covers homes going through a more traditional sales process, where the seller still lives there and the buyer is looking for a new home for their family. But the fact is that in the last two years, more and more properties are selling in situations where the former owner has left in anger, and the building has been left unoccupied, and possibly also unlocked, exposed to the elements and possibly also to neighborhood thieves. In some cases, scavengers may have removed not only the fixtures and appliances, but also perhaps some of the copper wiring and pipes. Vandals, squatters, and other critters may cause further damage through fires or floods. In such cases, the seller lowers the price and the buyer assumes the risk. "There's more risk involved," he said, "because when you have a foreclosure, you don't have a disclosure, obviously. You buy it as is, so typically those investors will go in and do their best to do their inspections and to make sure they understand exactly what they're buying. But I'd have to say there's definitely more risk and liability associated with those types of properties today." Still, Caltrider said his company has no qualms about working with investors who want to buy foreclosed properties, fix them up, and offer them for rent or for sale. "We allow them to put in a home warranty after all the improvements have been done on the home," he said. "So it's a nice pass-through. It basically says, 'We've done a good due diligence on our home. We've done our improvements. And we feel so confident with that that we're going to buy a home warranty, and put this on there, just in case there may be something that may happen at a later date.'" In October, America�s Preferred Home Warranty announced it would work with 4CS (a sponsor of this newsletter) to implement the 4CS iWarranty ServiceOn solution to streamline its warranty claims management process. America�s Preferred Home Warranty will use the on-demand ServiceOn solution to create and manage multiple policies, to capture all in-bound homeowner requests for repair services, to ensure the expedient delivery of the required home repair services, and to adjudicate all claims. Some additional functionality will have to be written into that package, however, because America�s Preferred Home Warranty also allows its policy holders to choose their own repair service contractors, if they wish. When a claim comes in, the policy holder is given the option of accepting a contractor selected by the company, or choosing their own licensed contractor. If the policy holder chooses their own contractor, they must arrange the appointment themselves. Once the contractor responds and makes a diagnosis, the technician must call America�s Preferred Home Warranty to negotiate what work is to be done, what parts are to be used, and what payments are to be made. And, of course, if the transaction works out to the satisfaction of all involved, America�s Preferred Home Warranty potentially has another contractor to recommend to its next claimant from that area. It sounds too good to be true: a home warranty company that welcomes foreclosures, and allows policy holders to choose their own contractors. But Caltrider said it's all part of a company effort to live by the "Golden Rule," the directive to "do unto others as you would have them do unto you," taken straight out of the Christian bible's book of Luke, chapter 6, verse 31. "We're a Christian-based company," Caltrider said, "which makes decisions based on biblical principles. And we as a company actually tithe off of our gross sales." And not only is the company heavily involved in its community and church, but so are some of the individual employees. Plus, the company gives money to employees each month, which they must then donate to the charity of their choice, he said. "So we're real active in the community." 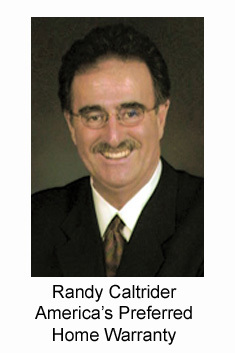 Caltrider said America�s Preferred Home Warranty has been in business for ten years, operating primarily in markets close to its Jackson, Michigan home. While Michigan is its best market, Ohio and Indiana aren't far behind. And besides that Midwestern cluster, the company also has operations in North and South Carolina, he said. "We make just enough to keep the doors open," he said. Prices are deliberately set to be around 15% below the competition's, and buyers are given the option of choosing an even lower up-front price in return for a higher deductible: $50, $75 or $100 per claim. The company does no telemarketing, preferring word of mouth and face-to-face marketing. Though Caltrider added that revenues have still grown at double-digit rates each year since at least 2005, even as property sales in the company's prime markets have slowed considerably. "We get a lot of people calling us to say 'thank you,'" Caltrider said. "We've been doing this a long time. A lot of other companies weren't doing it. And then all of a sudden the economy caved in. And you know what? You all better get on board with distressed properties." California could side with Apple on its policy to void smoker's warranties. Samsung extends Blu-ray warranties to cover problems caused by firmware updates. GM looks for root cause of a spike in warranty claims for Camaro output shaft failures. Free warranty coverage from credit card providers can give an extra year of protection. Australians' lack of knowledge on product warranties costs them billions of dollars a year. AmTrust Financial Services Inc. not affiliated with bankrupt AmTrust Financial Corp.
Arch Aluminum & Glass to honor warranty claims despite its bankruptcy. U.S. EPA postpones ruling on biofuel industry's request for 15% ethanol gasoline until mid-2010. Reaction to the EPA's postponed decision from the ethanol industry is mixed. Auto manufacturers say EPA delay allows more time to study 15% ethanol's effects on durability. Boat manufacturers pleased by EPA's delay to allow for more testing of 15% ethanol blends. Warrantech to administer service contracts for Queen City Audio Video Appliances. Medical device maker ends preventative maintenance under warranty, fails to tell customers. 3D Systems offers five-year warranty on ProJet 3000 Series print heads. Hammerax sees no returns in three years, lengthens warranty on cymbals to four years. Home Service USA direct mail for water line service contracts confuses some recipients. NEW challenges attack on the extended warranty industry made by Consumer Reports. Service Contract Industry Council responds to Consumer Reports. Holiday shoppers face a wide range of opinions about extended warranties. Little-known state law in Maine provides an implied warranty on products for up to four years. Texas attorney general settles extended warranty dispute with Conn's for $4.5 million. Daktronics sees lower warranty and manufacturing costs in latest fiscal quarter. Eaton launches three-tier extended warranty program for its Australian customers. U.S. government finds link between Chinese drywall and corrosion of pipes and wires. Consumer Reports survey finds 62% "can't stand the extended warranty hard sells." Calculating the value of an extended warranty for a laptop. General Motors Co. sues to recover $30 million spent on Chevy Cobalt steering warranty claims. Ontario Automobile Dealer Association partners with SAL Group for extended warranty programs. Home inspector in British Columbia must pay CA$212,000 for missing wood rot damage in home. APC by Schneider Electric to open a warranty support center in Nigeria. McCusker & Co. to provide underwriting and data management services for HVAC extended warranties. Apple tells smokers their machines are contaminated by nicotine and their warranties are void. Lenovo attacks SquareTrade's laptop failure rate study. Hitachi Global Storage Technologies selects HCL Infosystems for warranty services in India. Chrysler quality chief wants cars with zero warranty claims in the first three months. Chrysler's last chance to get it right. Avery Dennison to warrant graphics created by the Epson Stylus Pro GS6000 printer. Virginia Surety to provide underwriting and actuarial services to Preferred Warranties Inc.
Ford mnivans investigated for transmission failure pattern spotted by NHTSA. Nissan doubles Continuously Variable Transmission warranty to 10 years/120,000 miles. New Home & Appliance Warranties: At the midpoint of 2007, sales are falling faster than claims can be reduced, driving claims rate percentages upwards for many companies in the building trades. But unlike in the automotive or computer industries, claims in this sector were always rather evenly distributed among new home builders and their suppliers.